What is the future of digital trade? Join us at ITC to celebrate E-Commerce Week 2017 with the theme "Towards Inclusive E-Commerce"
The impact of digital trade and its potential to enable inclusive and sustainable growth have been recognised worldwide. How can the UN and International Organizations such as ITC empower women to connect to international markets? What can digital platforms like eBay do to promote new partnerships for digital innovation? This panel will bring together industry experts, policy makers, and international organizations that are using digital trade to expand business in the digital economy. 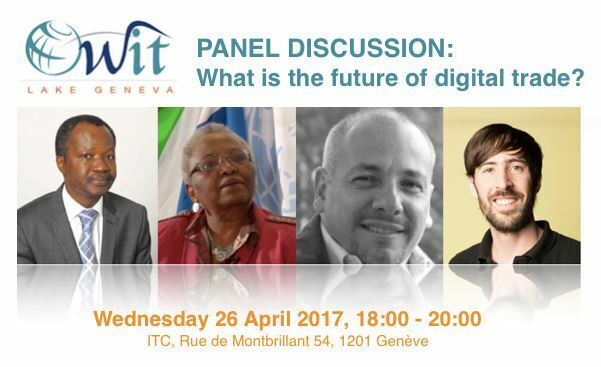 Speakers will share their experience and offer new insight on the opportunities and challenges presented by digital trade. Attendees will learn about emerging trends and how small and medium enterprises (SMEs) can leverage digital trade in global business. 1. What is the contribution of digital trade to the inclusive trade agenda? 2. How can the UN and International Organizations effectively partner with private sector to enhance global access to platforms for digital trade? 3. What specific steps can be taken to ensure the increased inclusion of gender perspectives in trade policies and platforms? Special thank you to the Grand Hotel Kempinski Geneva. We are delighted to offer complimentary registration to this event to current OWIT members, partners and special guests.